LONDON - Considering that Noel Gallagher wrote the majority of Oasis’ songs, best or otherwise, and that Liam’s role throughout their chequered history was to be the charismatic bit of rough, and bearing in mind that the latter’s contributions to the Oasis canon were hardly propitious, it’s actually quite staggering that Beady Eye’s debut album is anything less than abysmal. In fact, it’s pretty fine, really good in places, with moments that eclipse most Oasis material since (What’s The Story) Morning Glory. There isn’t a Beatles comparison that springs to mind, but it does strike one as being a little like The Who making a decent record without Pete Townshend. 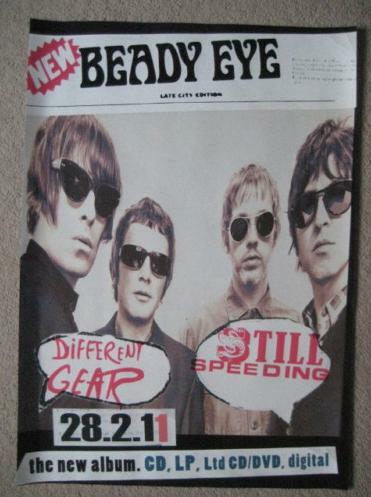 Different Gear, Still Speeding has the energy, if not the invention, of a classic Who album. Hardly surprisingly, however, it’s the Lennon and McCartney (and Jagger-Richards) songbooks, as well as the retro Merseybeat of The La’s, that prove the main inspiration – there’s even a track called Beatles and Stones. What did you expect? An album influenced by Burial and Ramadanman? Produced by Steve Lillywhite over 12 weeks in London’s RAK Studios during summer 2010, Different Gear... finds Liam, with Gem Archer on guitar, Andy Bell on bass and Chris Sharrock on drums, sharing songwriting duties and a commitment to upholding eternal verities: big riffs, pounding drums, and basslines that prop up simple melodies. That said, the songs here are less oikish, more nimble and nuanced, than a lot of Oasis’ ponderous later music. Four Letter Word is a strong opener, powerfully surging orchestral rock providing an effective showcase for Gallagher’s appealingly coarse bellow, which as ever serves to invest the banal lyrics ("Nothing lasts forever," apparently) with, if not meaning, then at least menace. Millionaire is a curious hybrid of folky Led Zep and Wings. Beatles and Stones sounds like The Rutles doing 19th Nervous Breakdown. The Beat Goes On captures some of the lysergic whimsy of Sgt Pepper's-era Lennon while Wigwam hints at what St John might be doing today had he lived. That’s a criticism of Lennon, by the way, but high praise indeed for Gallagher. The Morning Son is the epic closer that grows from an acoustic start towards a cloudburst of psychedelic colour and baroque instrumentation. It’s superb. Who’d have believed it? No one, that’s who. Well, apart from Liam.